Finding the right environment for a family member needing assistance can be overwhelming. The main question is: where can this individual live that provides a warm, caring, supportive and safe environment? Our staff is well trained in the art of being sensitive to the unique needs and characteristics of each resident. At the Oberon, we work closely with you to develop a care plan that addresses resident needs, preferences, security and safety. The care of our residents is our highest priority, whether is be physical needs, social encouragement, or the basics like meals, medication administration, housekeeping and laundry. Nursing home care is expensive and very often unnecessary. Alongside a thoughtful social approach that will contribute to your family member’s quality of life, our staff will provide ongoing assessments and observation to prevent and/or delay costly health services. Listening to our families, it is clear that a resident’s stay at The Oberon House should be extended for as long as possible. We work to ensure that unnecessary moves are avoided. Come visit our beautiful facility. The Oberon House sits on the south side of a dominant hill in Arvada, Colorado. With the city of Denver skyline visible to the east, Pike’s Peak to the South, and the foothills of Golden to the west, we offer a quiet residential setting with wonderful views. At night, the lights of Arvada provide a panoramic view to be enjoyed from our windows and patios. Come and spend some time with us. You will love what you find! Our Resident Services Director will assess and oversee the resident’s changing health needs, communicate with physicians and pharmacies, assist with scheduling appointments and required inoculations. 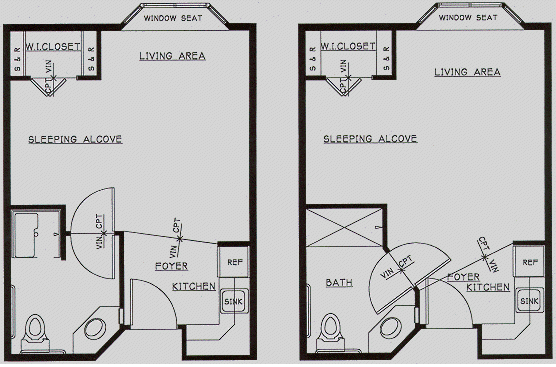 Measurements are approximately 14′ from Kitchenette to window, 16′ from Sleeping Alcove to opposite wall, and width of Sleeping Alcove is 8′ 5″. Rooms vary. Window seats are available in some rooms.